What I love about life on a fixer-upper farm is that no two days are alike. I have always loved variety. From whatever job I had outside the home to crafts the more variety involved the more I enjoyed it. CountryBoy and I worked on underpinning the front porch this morning. We used some old, original metal roofing from the farmhouse that we found in the barn and began custom-cutting each piece to fit the uneven ground. We had to use the backside of the metal because there was black tar on the other side. I love it! It’s kinda rough looking right now but with the addition of some plants and the finishing touches on the porch it’s going to look awesome! The BEST part about the under-pinning? It will keep the cats from using that area as a toilet. Peeeeuuuu! We’ve also come up with a solution for this wall. Say Hi to Creamsicle posing on the concrete step! It’s going to take some work but at least we have a plan now. I know. What a mess! But, we are going to add some structural support which means we can also add some insulation. The secret ingredient? Bacon grease! 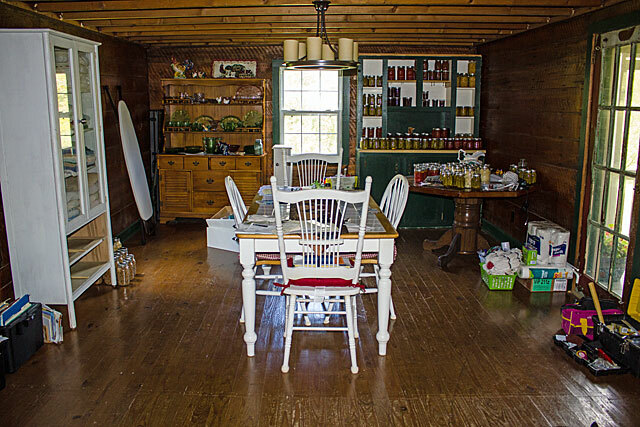 And, thankfully, a farm kitchen always has a jar of bacon grease! I checked on my bees since I knew they would need some water. There was lots of action in and out of the entrance. I tried to get a shot of the bees coming back with huge pollen sacks on their legs but they were too fast and my camera is having issues. Seeing those bees so active and bringing the pollen back is a good sign of a healthy and productive hive. Maybe I’ll get a bit of honey this year! While I was checking on the bees I took in the beauty of the blooming irises. These are near one of the garden entrances by the grapevine arbor. The purple and yellow irises are so pretty together. Speaking of grapes, I’m hoping for a few clusters this year. One of the grapevines shows a lot of promise with lots of teeny tiny grape clusters on it. The second grapevine has a few but not near as many as this one. I am purposefully walking to the mailbox each day for a bit of exercise. (If you read my last post then you know how much I loathe exercise, ha!) On my way back, I stopped at the barn to check on the girls’ egg-laying progress and FuzzyFoot posed for the camera so I obliged! Such a handsome and good rooster! And, it looks like we’ll have a dozen or more eggs today. My days can quickly fill up with all things farm-related but I am conscientiously making time in the afternoons and/or evenings to work on business ventures such as my Etsy shop and oily care packages for my Young Living team members. Each day is a different scenario, a different set of tasks but all too soon the day is gone and it’s time to lock the chickens up for the night. Life on the farm. I love it! OK, maybe not galore but we did manage to get quite a few projects done in the past two weeks. But, back to the past two weeks… after discovering that our chickens were still not safe even in the fenced in paddock we decided to close off a portion of the paddock and make a chicken run directly off the barn. We purchase 150 feet of chicken wire, re-used some metal fence posts from around the farm and got to work. After a long days’ work we had two sides done. Still to do was add the chicken wire to the outside of the fence by the driveway but, at least, they were safe from predators stalking them from the mountain side of the paddock. While we were purchasing the chicken wire I, of course, had to check out the clearance aisle where I found some lovely perennials marked down to $3. Score! So, we took a break from the chicken run to work on some curb appeal. Our driveway actually ends at the side of the house. There were a few Hostas and some wild Lemon Balm along the front of the porch and nothing along the back of the house where we and everyone else enters the house. I decided to move two of the Hostas, divide them and plant them along the back of the house from the corner of the porch to the door. Hopefully, they will fill out again but we’re liking where they are now. CountryBoy tilled the ground at the far corner of the porch and then I planted my clearance plants. He added some stones for me to help keep the weeds down. It’s easy to mow around and helps show off the flowers. All of my lovely clearance plants! Once that project was over we got back to work on finishing up the chicken run. The girls, and Fuzzy Foot the rooster, are happy and we feel good again about their safety. The next project was installing a temporary wall to close off the bathroom from the laundry nook and pantry. I say temporary because, one day, we have plans to renovate the bathroom after we get a half bath put in upstairs. We’re not sure when that will happen so in the meantime we decided that we needed to go ahead and close off and separate the bathroom from the pantry. Continuing the reclaimed fence boards we used in the pantry CountryBoy got to work on sanding the remaining boards down, putting up 2×4’s and cutting the boards to size to create the wall. 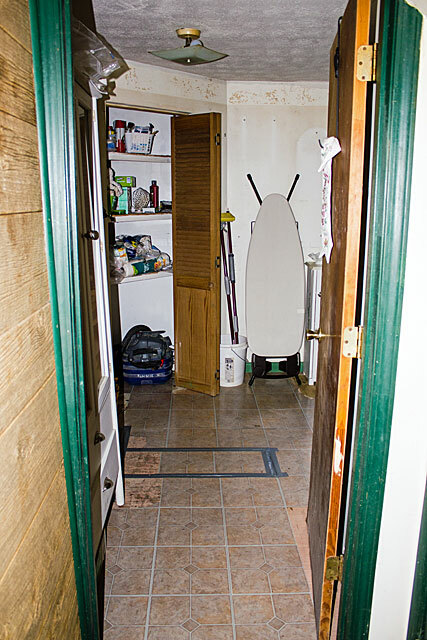 He also relocated the door into the pantry/laundry nook/bathroom and used it as the bathroom door. Since the wall is temporary I simply tucked the metal rack we’ve been using for towel storage in the wall alcove but removed several shelves to accommodate the wall mounted gas heater. CountryBoy added some small shelves by the tub/shower for a little bit of extra storage space. I can’t tell you how nice it is to NOT see the bathroom when I walk into the pantry for something or when I’m doing laundry. It’s the little things, haha! Yesterday, while CountryBoy was re-working our winter dining table (it sits directly across from the wood burning stove!) I got to work on the cover for the crib-bench in the living room. After mustering up the courage to cut the fabric, I washed it and finished cutting out the pieces that I needed. If there’s one thing that will make me procrastinate on starting a sewing project is the cutting of the fabric. You know, that whole fear of messing it up and then what do I do?! Once that’s done, it’s a piece of cake! I didn’t quite think the whole thing through when I started but it went together fairly easy and I’m pleased with how it turned out. I made it like a pillowcase with snaps on the one end so that it can be removed if it needs to be washed. Once CountryBoy was finished stiffening up and sanding down the winter dining table I did a final sand and put a couple of coats of polyurethane on it. I love how the polyurethane brings out the grain of the wood. CountryBoy made this table last year out of boards that were salvaged from right here on the farm. So pretty and ready for winter! I’ve also been removing Lavender seeds and flowers from a box of Lavender that we were gifted with as well as working on the ever-present need to get organized and find permanent homes for everything. Happily, I am finding those permanent homes and feeling a bit more settled in. I’m sure I’ve missed something else that we’ve done over the past two weeks but those projects were the bigger ones. Which one was your favorite? 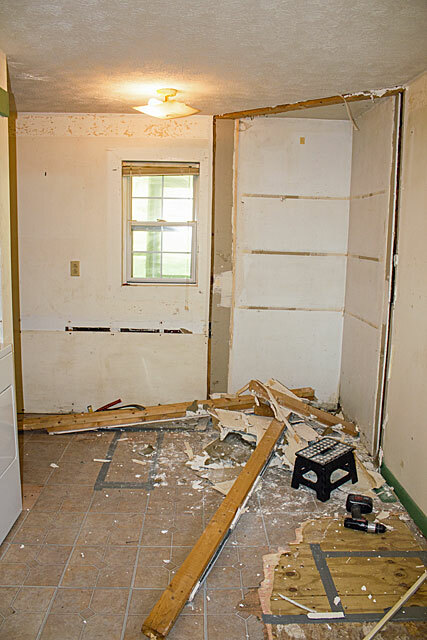 After moving into the farmhouse we decided, rather quickly, to completely gut the kitchen. Had we known that in a few weeks we would have a massive snow storm we might’ve considered waiting a bit but, that’s neither here nor there. We gutted it clear to the exterior wall exposing the house to some very chilly temperatures. 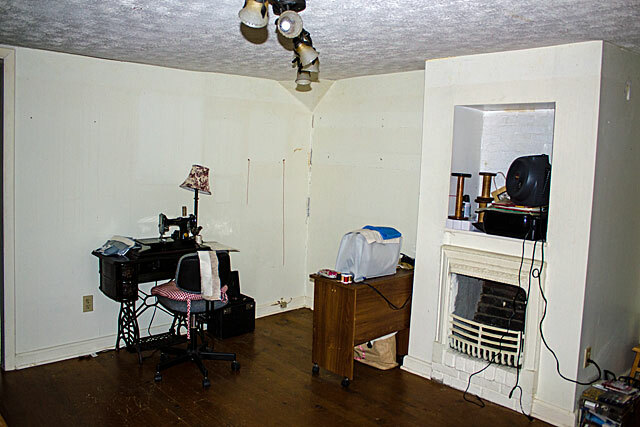 During the demo process we removed the drywall and discovered layer upon layer of wallpaper and even some newspaper covering the rough cut wood walls. We saved a section of them knowing we wanted to display them somehow. When I was in Florida back in January I had purchased a shadowbox that was 50% off and it has been taking up floor space in the pantry ever since. The weather today is cold with snow flurries off and on. Not a good day to be working outdoors if one doesn’t have to. So, it seemed like a good day to finally do something with the ancient wallpaper. 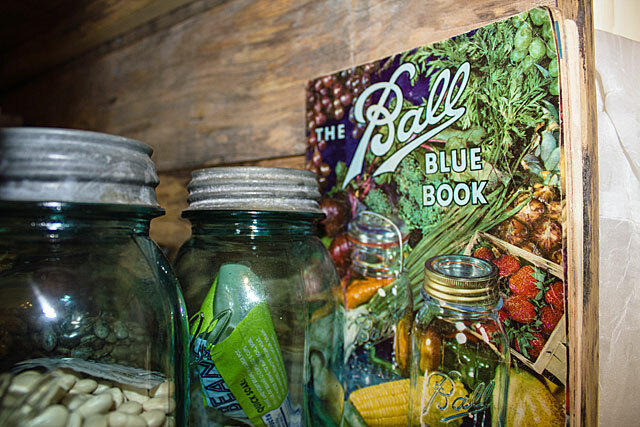 CountryBoy took on this project and enjoyed sifting through the layers and creating the display. 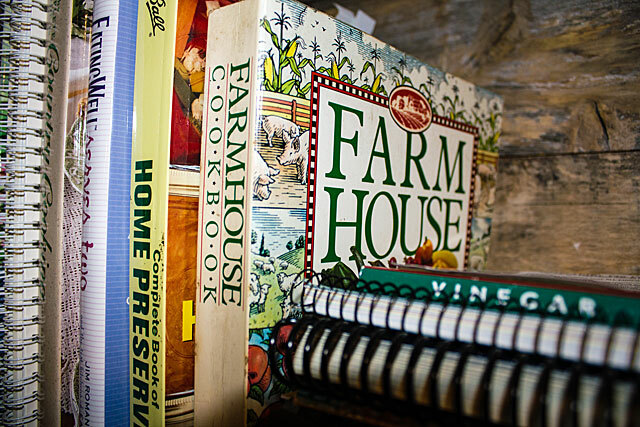 I’m happy we kept it and now some of the history of the farmhouse kitchen is on display. A couple of weeks ago I started a seed germination test on beefsteak & roma tomatoes, green peppers and jalapeno seeds. The green pepper seeds did nothing and appeared to be molding up so I tossed them and all the seeds as well. Who knows how old they were. They were some I had saved a few years back, so, not a huge loss but disappointing nonetheless. I started another germination test using some seeds I saved a few weeks ago from a pepper I used. We’ll see how they do and if nothing then I’ll buy a pack of seeds. The jalapeno seeds also did nothing but they were not moldy so I will let them go a bit longer. We’ve not had very many sunny days so that may be part of the germination problem. Both the beefsteak and roma tomato seeds did well with 7 out of 10 seeds sprouting with nice roots. I went ahead and planted all of them since the remaining seeds appeared to have a root starting to emerge from the seed. If those seeds end up sprouting then I will have a germination rate of 100% of the tomato seeds. Currently, the germination rate is 70% which is pretty good. The beefsteak seeds were purchased last year and the roma’s are from seeds I saved and are, at least, over a year old so I’m happy they did so well. If the rate remains at 70% I will simply start a few extra seeds to make up for the ones that may not germinate. CountryBoy saw where someone had used toilet paper tubes to start their seeds in then you simply put the tube in the ground when ready. Sounds easy enough so we’ve been saving them. I put ten tubes each in two shoebox size plastic totes, added seed starter soil and placed the tiny sprouts one per tube. I think they’re happy to be out of the cramped quarters of the paper towel and baggy! Now if we could get some sunshiny days to help these guys along. Have you started any seeds yet? Are you planning on it? If so, what are your garden plans this year? I’d love to hear about it! I wandered around the farm the other day with my camera in hand. I saw a few signs that Spring is on its way. Yay! The chickens have done a great job of clearing away all the weeds which saved me a LOT work! Thank you girls :). It is all gone now but the forecast, as of today, is calling for snow showers on Thursday. oh boy! Thankfully, the snow won’t bother what’s already coming up. whew! The deterioration started last Spring when we received copious amounts of rain and the force of the water coming down off the mountains started washing out the rocks. Then with each rain then the melting of all the snow it has just continued to deteriorate and here we are almost into Spring again. It’s hard to tell from the photo but there are some spots where it has eroded a foot or more. Before spending any money to fix the driveway we need to address the runoff of the mountain issue otherwise any monies spent would be washed away into the creek. We got an estimate to have a pond dug at the base of the hill beside the barn, culverts placed where necessary and the driveway fixed but, truth be told, it was way more than we can afford. I have entered the farm into a contest with Hobby Farm magazine and BobCat where the winner will receive a week’s worth of whatever needs done using BobCat equipment and a crew. I focused on our need to solve the runoff issue for not only the driveway but also the barn where water goes as well making four of the stalls unusable in rainy season. Needless to say, I am praying hard that we win! I’d love it if you’d send up a prayer or two also :). I think the winner will be chosen sometime in April or May. If we don’t win, well… I don’t know; we’ll figure something out. Last Friday and Saturday were beautiful so we took advantage of it and headed outdoors. More progress was made in and around the chicken coop. We straightened up a little more and salvaged what wood we could by cutting off rotten ends. Since our budget is slim to none on the coop redo we are using what’s already in and around the farm. One such item we were reusing were the roosts for inside the coop. I liked the poles of the pole shed and wanted to use them for the roosts. They were well-worn tree limbs or small trees and I thought they would be perfect! The thickness of them were good where the girls could still wrap their feet around it yet big enough so that their feet would be mostly, if not completely, covered when they hunker down therefore helping to keep their feet warm during the cold, winter months. I also really like the look of them :). But, in order to use them we had to get rid of the pole shed. After we relocated everything from underneath and around the pole shed CountryBoy made quick work of it by simply removing the side braces then pushing it over. That’s how rotten most of the poles were. We still have to remove the shingles and salvage what wood we can but that thin white line on the ground is the roof. Now we had some wood to make new roosts for the girls. This arrangement works much better making the coop roomier and giving the girls more room to jump/fly down from the roosts. We also made it wider to accommodate the chicks we are getting in April. This should be sufficient to accommodate our future flock of 26 comfortably. I think they like them! Oh, and aren’t the pole shed poles perfect for roosts?! Still to do in the coop are adding more nest boxes and building the grow-out coop. Bit by bit. I have enjoyed spending time in my sewing room this winter because before long I won’t have the time or the energy to do much sewing once the ground warms up and it’s time to get the gardens going. Then my days will be filled with mowing, weeding, harvesting and preserving. To everything there is a season so I am making the most of winter :). I’m also hoping to be able to open up my Etsy shop again or maybe create my own site therefore cutting out the middle man. We’ll see. All in time. Bit by bit! At the beginning of September we decided to tackle a portion of the current bathroom, laundry room and wasted space room. We have one indoor bathroom (and an outhouse!) 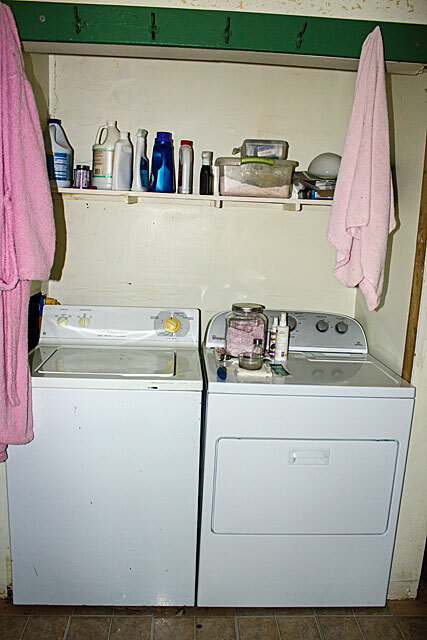 but part of that bathroom included the washer & dryer and a good size space with a corner closet. Wasted space if you ask me. And the corner closet? I hated it. I could never figure out how to arrange stuff in there where whatever ended up in the back corner of the closet wouldn’t be swallowed up and forgotten. It was also scary to me and I wanted it gone. 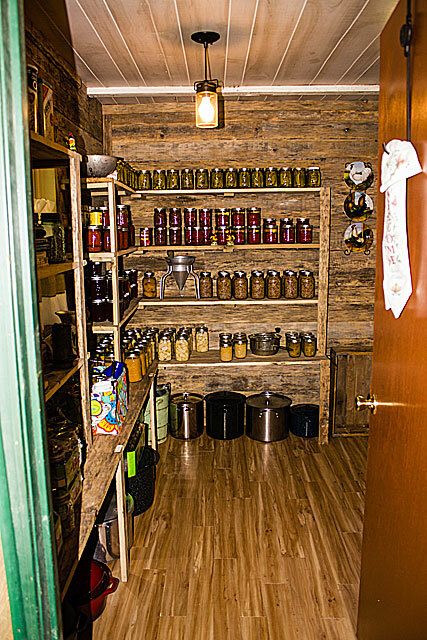 I wanted to convert the wasted space into a pantry. 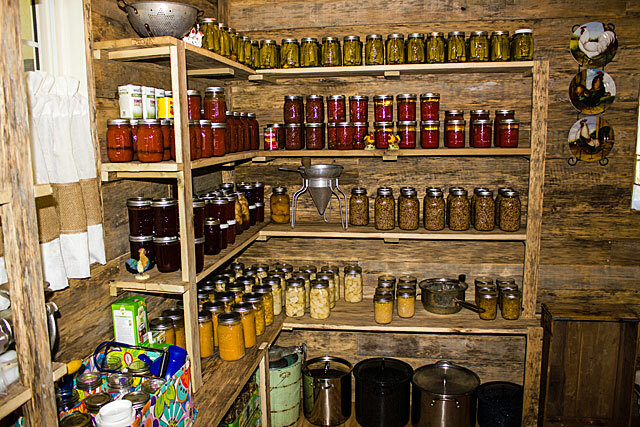 A place where we could store all the stuff we’ve canned that was sitting on the floor in the dining room, on a cabinet we tore out of the old kitchen, on a spare table, and wherever else we could find room for the jars. So, we decided to go for it and tackle that room (with the exception of the bathroom) so that we could have our dining room back. As with any project we started it thinking it would be a fairly simple job. Pshaw! You would think we would know better by now. Ha! A bouncy floor that we had to cut into last winter to repair busted pipes and wrap heat tape around. A wall that we had to cut into to also repair busted water pipes. And, of course, the corner closet. 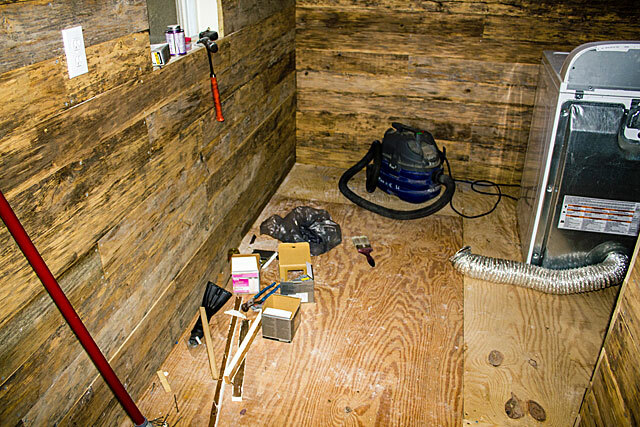 CountryBoy pulled all the old 1/2 inch plywood flooring up and replaced it with 3/4 inch plywood in the soon-to-be pantry and laundry nook areas. Much sturdier to walk on now. Then he spent many hours sanding some old fence boards he salvaged from the neighbors burn pile (with permission, of course) and started covering up the stained and holy drywall. He covered up the ceiling, hung a new light fixture, put new light switches and outlets in, made and installed shelves, and we both tackled the floor which is peel and stick vinyl. I have to say, it looks amazing! 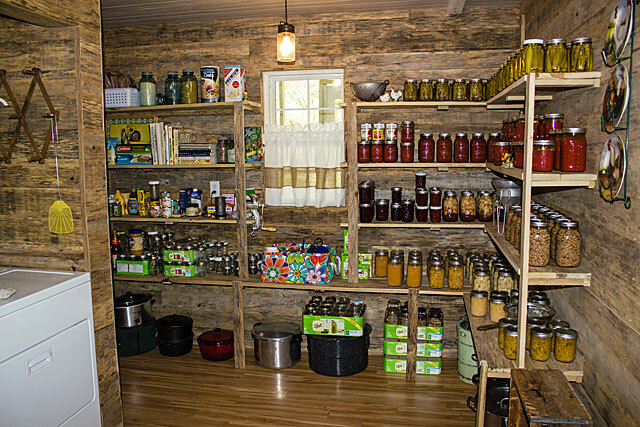 What a transformation of a wasted space into a beautifully rustic and useful space to showcase all our homegrown goodies! 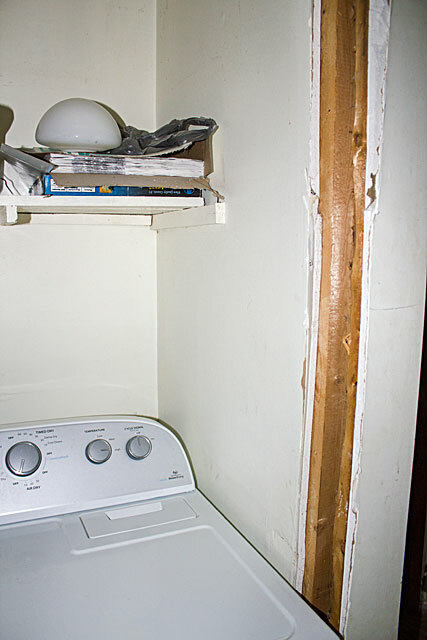 The shelf was too high for me to reach; there was a hole to the left of the washer where we had to, you guessed it, repair busted water pipes; and there were ‘lips’ on the side walls leaving gaps between the washer & dryer and the wall. I wanted it flush. 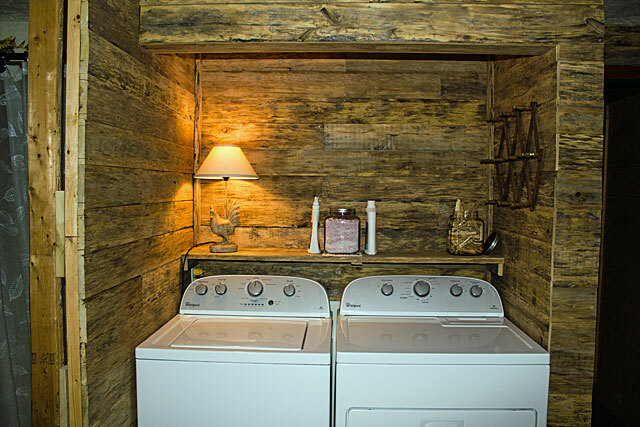 So, CountryBoy removed the ‘lips’, extended the wall by the washer which will be part of the future enclosed bathroom wall, added the rustic fence boards and made and installed a shelf just above the washer and dryer for me. 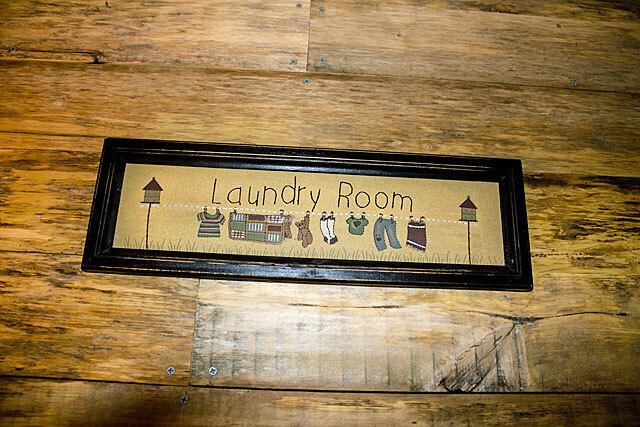 We found an antique washboard and a Laundry sign to finish off the Rustic Laundry Nook. I love it! I am, actually, one of those weirdos that enjoys doing laundry and this nook makes me want to do a load every day but we just don’t have enough laundry for that, ha! Just about my only contribution to these spaces, besides design ideas, were helping to carry the 3/4 inch plywood, ‘stocking’ the pantry, helping with the vinyl floor and making the curtains. I used pieces of leftover sheer curtains from when I hemmed our bedroom curtains and some burlap that I had. 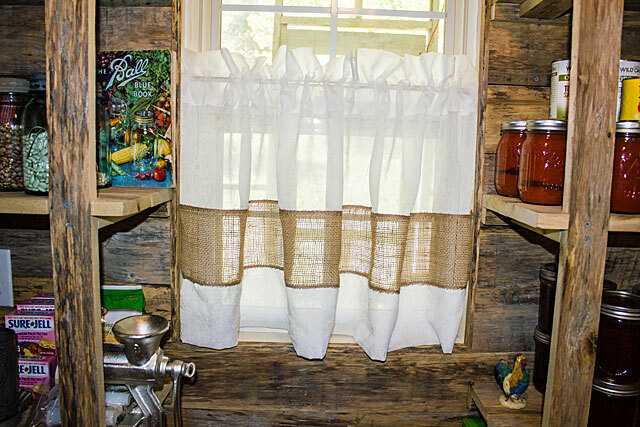 I originally planned on a valance type curtain for the top of the window but CountryBoy had a better idea of a café style curtain to help with privacy and so he could still look out the window. So, I added another scrap piece of curtain to the bottom of the burlap to make them longer and into the café style curtain. I like the way they turned out and I like his idea! Eventually we will close off the bathroom from these two areas but, for now, 2/3rds of this space has had an amazing transformation. I’m a happy girl! And, so very, very thankful to have a handy husband! I am thrilled to be able to tell y’all that some major progress has been made in the laundry nook and my sewing room. 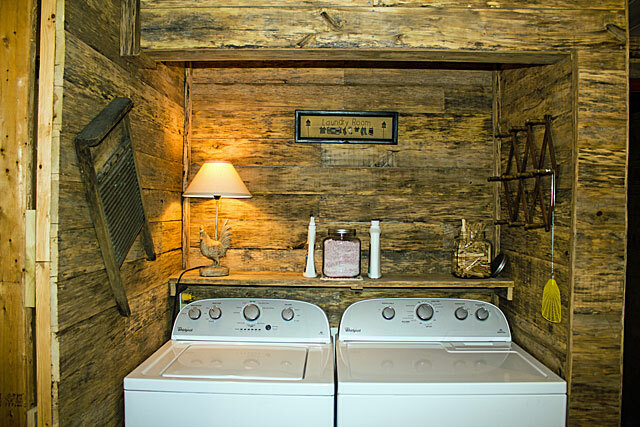 In fact, I am thrilled to say that the laundry nook is D-O-N-E. Yay!!!!! The shelf was too high for me to reach so the detergent sat on the dryer so I could easily get to it. A portion of the wall was removed last winter when our pipes kept freezing and remained that way until we tackled this area. We replaced the dryer that came with the house after we thought it wasn’t working shortly after moving in. Come to find out, the dryer vent was clogged. oops! 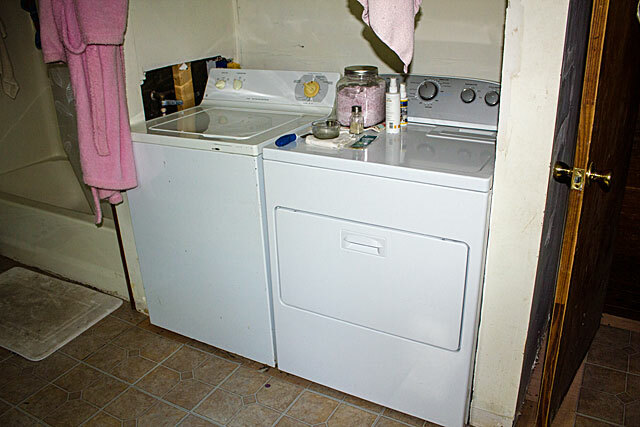 The washing machine was actually in need of replacing but we kept it for a while until we could afford to get a new one. And, one that matches the new dryer, yay! It was delivered this morning and I’ve already done a load of wash. It works good! And, looks good! CountryBoy extended the wall beside the washer which, eventually, will become part of the enclosed bathroom, installed the reclaimed wood on the walls, mounted a shelf that I can reach, replaced an outlet and cover plate and hung an expandable peg rack. 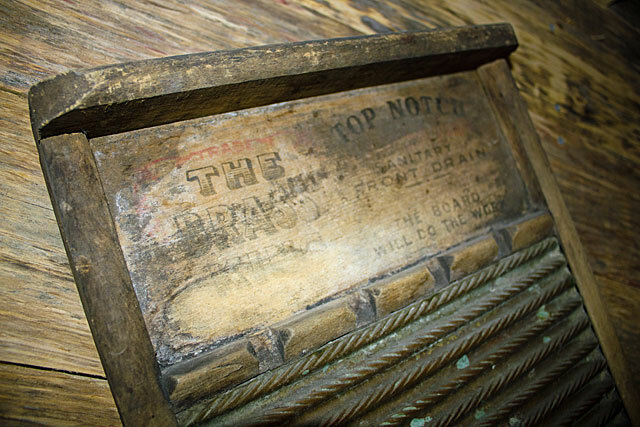 There are only two more things that I’d like to find for the nook… some sort of ‘Laundry’ sign and an old washboard. I might have to make the sign if I can’t find the right one but I think those two items will make it complete without cluttering it up. The other room that saw some progress today was my sewing room. 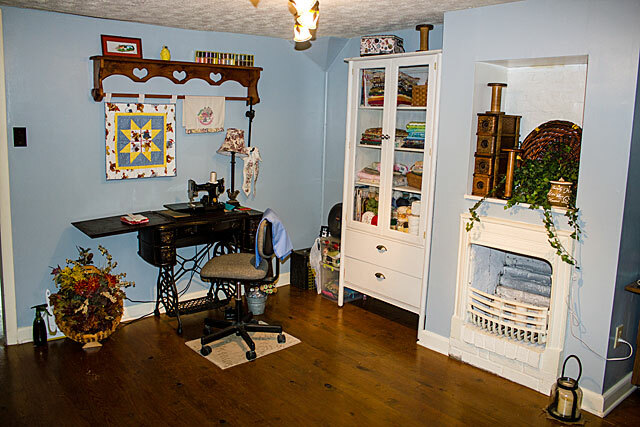 Several months ago, CountryBoy and I painted the room then I arranged my sewing stuff so I could do some sewing when the need and/or time arose knowing it was a temporary arrangement until we tackled that room. Originally, I brought a metal shelf unit up there to store my fabric on. It worked but did not look very good. During the pantry/laundry room renovation I decided that the white cabinet where I was storing the towels would make a good storage piece for my fabric and yarn stash. So, I brought the metal shelf unit back down and put the towels on it and we moved the white cabinet upstairs this morning. Then, I rearranged again and while CountryBoy was helping a neighbor cut some wood I filled the cabinet with fabric and yarn. It’s looking better but there’s still much to do up there like finding or building a cutting table and more storage. That will be down the line but, for now, it’s a nice space to do some sewing while the laundry is going! Many of you know, and for those of you who don’t, we are in the midst of renovating a 100 year old farmhouse. Bit by bit. We tackle one area at a time and, since we are doing it ourselves (mostly CountryBoy with a bit of heavy-lifting assistance from me) it takes time to get the area completed. In the meantime, whatever was in that area has to be moved to another location so that it’s not in the way. Currently, the latest area of renovation is the pantry/laundry/bathroom room. (Yes, it is all one room. For the time being. More on that later.) So, everything that was being stored in the scary corner closet had to come out as well as the cabinet that is currently housing the towels and rags. It all ended up in the dining room. 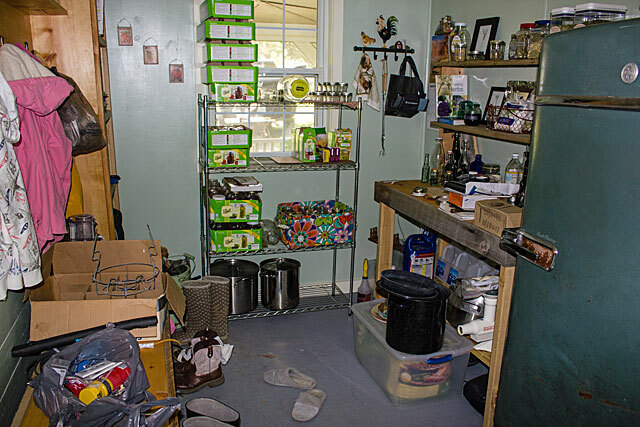 Tool boxes & bags, toilet paper, paper towels, cleaning stuff, home canned goods, etc., etc. 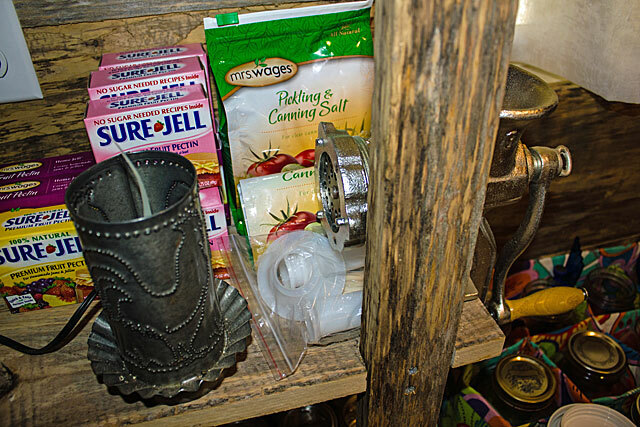 The mudroom is packed with things that are waiting to be stored in the pantry area. 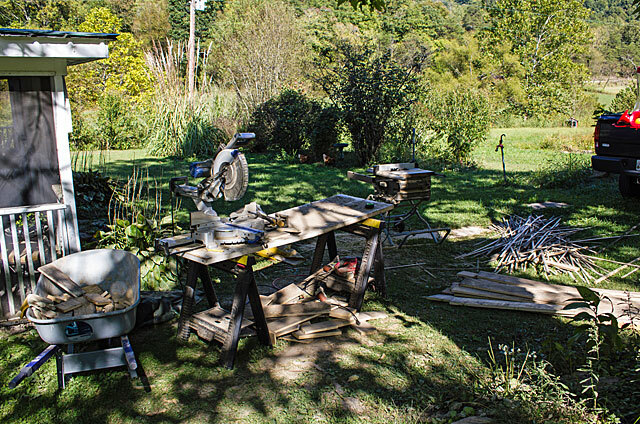 Power tools, lumber, wood scraps and sawdust in the yard. Boxes of screws, nails, tools, broom, Shop-Vac, etc. in the room that is being renovated. And dust. Lots and lots of dust. I know it is temporary so I try to not to look at it. And, I know that, in the end, that dealing with stuff everywhere will all be worth it when the area is complete. I have thoughts of the final touches already, woohoo! But, at the same time, trying to contain my anxiousness and excitement until it is finished. Now, to dust or not to dust? Nah, it’ll just get dusty again, ha!